It�s a sign of the great club spirit at Tottenham that Christian Eriksen and Toby Alderweireld were having a mock war on line yesterday as to which of them scored the best long-range goal in the 4-2 dismantling of Paris Saint-Germain in Orlando. And it is this team camaraderie that Mauricio Pochettino is determined to protect at all costs, and explains in part why he is so cautious about which new players to bring into his settled squad. He plays his transfer plans close to his chest, but it is the team card that is his hidden ace. In Pochettino we must trust, and the impatient people on line aiming insults and abuse at him and Daniel Levy over their transfer policy should button it. My count of players in which Spurs have shown interest according to the ITKs is now 87. 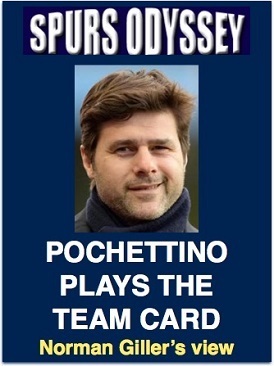 Let�s leave it to the Poch to take his pick. After all, you wouldn�t tell Jordan Spieth which iron to choose. Leave it to the experts. We must not read too much into the encouraging victory over star-studded PSG, and I would have made the same statement had Spurs been on the wrong end of the result. Pochettino made seven changes during the game and PSG were also obviously experimenting, so it would be ridiculous for anybody to judge this as anything other than a friendly warm-up for the tough challenges to come. It was interesting to see Poch unveiling 17-year-old Tashan Oakley-Boothe, the first ever Millennium baby to play for Tottenham. He has been taken on the tour to give him a taste of senior football, and he looked a man in boy�s boots in his 45 minute run-out. Another for the future from the Tottenham academy that is proving a gold mine. Now we wait anxiously to see if the transfer talk centering on Eric Dier grows from whispers into ear-shattering fact. He has admitted to me that the club he supported as a boy growing up in Portugal was Manchester United and that he always dreamt of playing for them � echoes of Gareth Bale and Real Madrid. Jose Mourinho has made no secret of his admiration for the utility defender. Eric's wages would double from the �70k he collects at Spurs. That is quite an incentive for a move! Could it be that Dier�s last act for Spurs was his freak goal against PSG, when a wild goalkeeper clearance hit him in the shin and rebounded into the net? Tomorrow, Spurs play Roma. But don�t read anything into the match other than knowing Pochettino is strengthening the all-important all-for-one-and-one-for-all team spirit. That�s his trump card, with or without Eric Dier. NOW join me for the further adventures of Tottenham�s Double year of 1960-61, focusing on Part Eight of our visit to the greatest season in the club�s history. On the 50th anniversary of the FA Cup victory over Leicester at Wembley, I combined with entrepreneur and life-long Spurs supporter Terry Baker to produce a limited edition book of the Golden Double, that was introduced and autographed by Braveheart Dave Mackay. WOLVES were Tottenham's closest challengers in the chasing pack, and their resolute manager Stan Cullis had not yet thrown in the towel. He played mind games before the kick-off by suggesting the pressure of hunting the League and Cup Double was weighing heavily on the Spurs players. This seemed a nonsense in the tenth minute when the ball went from Maurice Norman in the Tottenham goalmouth, to Blanchflower, to Mackay, Dyson and then Bobby Smith, who crashed the ball home for a breath-taking goal. This was a goal in typical Spurs style, and the opposite to the way Wolves played the game. Cullis believed in route one, and the fact that they had scored a century of goals in four successive seasons during the 1950s gave strength to his argument that "the more times you have the ball in the opponents' penalty area, the more goalscoring chances you will create." The hopes Wolves had of winning seemed to lessen when skipper Bill Slater went off with damaged ribs following a collision with the powerhouse that was Bobby Smith. This was four years before the football rulers had the sense to introduce a substitute rule. Slater bravely came back on after being strapped up and played gingerly on the wing. As often happens when playing a handicapped team, it was Tottenham who lost their rhythm and midway through the first-half a rare mistake by Blanchflower allowed Ted Farmer in for an equaliser and his 22nd League goal in 21 games. Battling Wolves thoroughly deserved their point. QUOTE � Stan Cullis: "Tottenham are clearly favourites to take the League title, but they also have eyes on the FA Cup and they could yet fall between the two. They now have a lot of psychological pressure, and it is up to all the chasing teams to show that the title race is far from over." THIS match pitched against each other two of the greatest Scottish footballers ever to grace the English soccer stage � Denis Law and Dave Mackay. Law had joined Man City from Huddersfield for what was then a record �53,000 (today he would be worth �53 million). Almost single handed, he was making City a power in the First Division, but waiting for him in this crucial battle at Maine Road was the one and only Dave Mackay, the braveheart of the Spurs. It was Law who had the better of the duel with Mackay in the first-half, playing here, there and everywhere as he tried to find a way through the Tottenham defence in which Tony Marchi was doing a solid job deputising at centre-half for the injured Maurice Norman. As the Maine Road pitch became a skating rink under a river of rain, Mackay started to cut down on Law's freedom, and in the second-half Tottenham were continually in the ascendancy. They picked up the pace and the pressure and the goal they deserved came on the hour. Terry Medwin, deputising for Cliff Jones, sprinted past his marker to meet an inch-perfect centre from Danny Blanchflower, heading the ball into the City net off a post. Tottenham were content to concentrate on contain and counter tactics as they cruised through the last half hour for a win that was much more emphatic than the scoreline suggests. QUOTE � Denis Law: "During my career I was lucky to play with and against some of the best post-war teams. I can state quite categorically that Tottenham were up there with the best of them. They had all-round strength and skill, and each of their players was comfortable and confident on the ball." TEAM AND SCORERS: Brown, Baker, Henry; Blanchflower, Marchi, Mackay; Medwin, White, Smith, Allen, Dyson. ROKER PARK was heaving with a sell-out all-ticket crowd. The magic of the Cup had grabbed the Sunderland supporters, who were excited by the potential of their team who had lost only one of 20 Second Division games during the run up to their Cup challenge. Arsenal had fallen at Roker, and the young Sunderland team had seen off Liverpool and Norwich City in away Cup ties. The Roker Roar was briefly silenced when the fit-again Cliff Jones scored one of his typical solo goals in the ninth minute, but the North East fans got behind their heroes and were like a 12th man as they screamed their encouragement. Sunderland's goal survived several scares before they pulled level four minutes into the second-half. They forced three corners in quick succession, and the hectic, non-stop pressure eventually brought an equaliser from 18-year-old inside-left Willie McPheat after centre-half Charlie Hurley had beaten Maurice Norman in a high-jumping duel. Suddenly the Double was looking doubtful as Sunderland came rushing forward, unleashing an avalanche of attacks. It took all of Danny Blanchflower's famous coolness to discipline a defence that was buckling. The Sunderland hurricane gradually eased as young legs became tired, and Tottenham managed to weather the storm. By the end of a memorable match Spurs were in control and you could sense Sunderland's best chance of causing a massive upset had gone. QUOTE � Danny Blanchflower: "I have never known a crowd atmosphere like the one here at Roker. I could not hear myself think, let alone shout instructions. We were very relieved to hear that final whistle and to still be in the competition. We are going to have to be at our very best in the replay at White Hart Lane." VETERAN Tottenham fans who were there remember this FA Cup quarter-final replay as one of the craziest yet most exciting nights ever at White Hart Lane. Thousands, including many ticket holders, were locked out, and several Tottenham players only made it to the ground just in time for the kick-off. Bobby Smith abandoned his car and finished the journey on the back of a police motor cycle. It was just as crowded in the Sunderland penalty area as Tottenham put them in their place with an exhibition of attacking football at its most polished and potent. Super Spurs were three goals clear at half-time and cantering towards the semi-finals. Les Allen scored with a thunderous shot after 27 minutes, and Bobby Smith made it 2-0 four minutes later after goalkeepr Peter Wakeham had failed to hold on to a Cliff Jones shot. Dyson added a third from a Jones centre in the dying moments of a first-half in which Sunderland were rushed off their feet. Sunderland skipper Stan Anderson was an attacking right-half almost in the Blanchflower class, but he had to work overtime helping out his beleaguered defence. They cracked again in the 65th minute when Les Allen danced and dribbled his way past four challenges before releasing the ball for Dyson to collect his second goal. Five minutes later the buccaneering Mackay picked his spot and cracked in goal number five with his lethal left foot. The jam-packed crowd were delirious. QUOTE � Bill Nicholson: "We have Burnley between us and the final at Wembley. They are the reigning League champions and an outstanding team. We still have it all to do." Goalscorers: Allen, Smith, Dyson (2), Mackay. FROM the high of reaching the FA Cup semi-final Spurs crashed to a low of losing to a Cardiff City team that twice came back from a goal behind to win a match in which Tottenham were punished for casual and careless defensive play. The game was switched to the Saturday evening because Wales were playing in a rugby international at Cardiff Arms Park, and when they beat Ireland by nine points to nil Danny Blanchflower said, prophetically: "This will get the crowd up. Every Welshman's passion is raised by a rugby victory." Cliff Jones, son of Swansea, nodded his agreement. Terry Dyson quickly stifled the Welsh cheers when he snatched a third minute goal, and then seven minutes later City outside-left Derek Hogg was given unexpected time and space to pick his spot for an equaliser. A neatly taken goal by Les Allen restored the Spurs lead, but they were lethargic at the start of the second-half and paid for their poor discipline by conceding goals by Brian Walsh and Derek Tapscott. As Blanchflower had predicted, there was a special spirit surging through the Cardiff crowd that lifted their players to superhuman efforts, and they held out under a barrage of Tottenham attacks in a frantic final 20 minutes. Spectators rushed on to the pitch at the final whistle and hailed the Cardiff players as if they had just won the FA Cup. What they had achieved was a victory over Tottenham for the first time in Cardiff. Suddenly the Tottenham lead at the top of the table was not looking so emphatic. QUOTE � Bill Nicholson: "This was without doubt our worst defensive display of the season, and we got what we deserved. I have been doing my best to play down talk of the Double and I am not going to discuss it now. I will only talk about football not fantasy." Join us here next week for another thrilling instalment as Super Spurs prepare for the FA Cup semi-final shown against Burnley. Last week I asked: Who was the only London-born Tottenham player to appear in an Olympics and play just one match for the full England team while wearing the No 11 shirt? Many of you dived in and came up with Steven Caulker because of the Olympics link, but the key to the question was the No 11 shirt. This was worn by the great George Robb, a magical left winger for Tottenham in the 1950s when he combined his football with a distinguished teaching career. He won 17 amateur England caps and his one full appearance was, unfortunately for him, in the 1953 6-3 drubbing by Hungary at Wembley. George was quick, tricky and had an educated left foot as well as a brain the size of Mars. He took over the No 11 shirt from Push and Run hero Les Medley. First name drawn from the correct answers was John Pearson from Cornwall, who has been a Spurs supporter since his schoolboy days in Finchley in the 1940s. He recalls watching Robb play for his local team Finchley before he joined Spurs. I will send John a screen version of my Spurs �67 book (you might consider buying a signed copy from me at http://www.normangillerbooks.com � all profits to the Tottenham Tribute Trust to help our old heroes). This week�s teaser: Which Yorkshireman was a youth player with Leeds, has won 12 England caps and scored in his League debut against Arsenal? Email your answer please to SOQLTeaser12@normangillerbooks.com Closing date: midnight this Friday. I will send a screen version of Spurs �67 to the first name drawn from the correct answers.